The Toronto van attack was a vehicle-ramming attack that occurred on April 23, 2018, in Toronto, Ontario, Canada in which a rented van was driven along Yonge Street through the North York City Centre business district, deliberately targeting pedestrians, killing 10 and injuring 16, some critically. The attack started at the intersection of Yonge Street and Finch Avenue and proceeded south along the sidewalks of Yonge Street to near Sheppard Avenue. The 25-year-old male driver was arrested uninjured just south of the crime scene after attempting to provoke a police officer to kill him. The arrest was made at 1:32 p.m. EDT, seven minutes after the first 9-1-1 call reporting the incident was made. The incident is the deadliest vehicle-ramming attack in Canadian history. The first 9-1-1 call reporting pedestrians being hit was received at 1:25 p.m. Eastern time. At Finch Avenue, a white Chevrolet Express van, rented from Ryder, ran a red light, then drove southbound on the west-side sidewalk of Yonge Street, striking multiple pedestrians. The van continued along the sidewalk for several more blocks striking additional pedestrians. Security camera video from a local business shows the van reaching Tolman Street, which is one block south of Finch Avenue, at 1:24 p.m. A witness said the driver looked the victims directly in the eye during the attack and acted as if he was "playing a video game, trying to kill as many people as possible". At one point, the van re-entered the roadway due to the narrowness of the sidewalk, but at Park Home Avenue, the van drove onto the sidewalk once again hitting pedestrians along the sidewalk in front of Mel Lastman Square, a civic plaza on the west side of Yonge Street, 1.4 kilometres (0.87 mi) south of Finch Avenue (16 blocks). Paramedics were dispatched immediately to the site and Sunnybrook Health Sciences Centre was activated as an emergency centre. Nine people died at the scene and fifteen were injured. At 8:15 p.m., the Toronto Police Service (TPS) announced that a tenth person had died. Sunnybrook treated ten victims. The hospital reported that two persons arrived without vital signs and were pronounced dead on arrival, five were in critical condition, two serious and one in fair condition. A single police officer in traffic control capacity, TPS constable Ken Lam, intercepted the damaged van, which was stopped on the north sidewalk on Poyntz Avenue, just west of Yonge Street and two blocks south of Sheppard Avenue, about 2.3 kilometres (1.4 mi) south of where the attack began. Lam stopped his cruiser near the van and confronted the suspected driver, later identified as Alek Minassian, standing near the opened driver-side door. During the confrontation, Minassian repeatedly drew his hand from his back pocket and pointed a dark-coloured object toward the police officer as if it were a pistol. Lam ordered Minassian to drop to the ground, while Minassian tried repeatedly to provoke the officer to kill him, demanding he be shot "in the head!" when the officer warned him he may be shot. Lam then went to his cruiser and turned off its siren. As Minassian and Lam advanced towards each other, the officer recognized that the object in Minassian's hand was not a gun, holstered his pistol, and took out his baton to avoid the use of unnecessary lethal force. Minassian then dropped the object from his hand, lay down on the ground and surrendered to Lam. He was arrested at 1:32 p.m.
Police identified the suspect as 25-year-old Alek Minassian, who had no prior criminal history. According to his LinkedIn profile, he was a student at Seneca College in North York from 2011 to 2018 and lives in Richmond Hill. Minassian had attended Sixteenth Avenue Public School, an elementary school in Richmond Hill, in a special education class. He was a software and mobile app developer. His former classmates at Thornlea Secondary School in Thornhill described him as "not overly social" and "harmless". Minassian attended a special needs class for students within the autism spectrum while at Thornlea Secondary; Minassian's mother is quoted as saying in a 2009 article that her son has Asperger syndrome. In late 2017, Minassian enrolled in the Canadian Armed Forces for two months, before requesting voluntary release after 16 days of recruit training. A senior military official said that Minassian "wasn't adapting to military life, including in matters of dress, deportment and group interactions in a military setting" and "there were no red flags and nothing that would point to anything like this." 4chan (specifically the /R9K/ board) is a popular but controversial Internet imageboard. "Chad" and "Stacy" are nicknames used on incel-related forums and on the /r/incels subreddit (banned since November 7, 2017) on Reddit to refer to popular, attractive, sexually active men and women; a subreddit is an individual community on Reddit based on a topic of interest. The term "Incel Rebellion" is sometimes used interchangeably with the term "Beta Uprising" or "Beta Male Uprising", which refers to a violent response to sexlessness, which incels view as sexual deprivation. Elliot Rodger was the mass murderer behind the 2014 Isla Vista killings in California. Rodger intended to target attractive women and sexually successful men, which led to him being posthumously idolized by some people on misogynistic online fringe communities, including several incel websites. Facebook verified the account as Minassian's. A source in the Department of National Defence told media that C23249161 was Minassian's military identification number during his army training. On April 24, Minassian appeared without a lawyer before the Ontario Court of Justice in a Toronto courthouse, shackled and wearing a white prison jumpsuit. He was charged with 10 counts of first degree murder and 13 counts of attempted murder and ordered not to contact any of the alleged attempted murder victims. His father, Vahe Minassian, attended the hearing and cried. He told reporters that he had not spoken to his son. Minassian was charged with three additional charges of attempted murder on May 10: a total of 16 counts. He has since retained Toronto criminal lawyer Boris Bytensky to represent him. His trial is scheduled for February 2020. Toronto police reported the majority of victims were female, but that there was no evidence women were deliberately targeted. Minassian was also charged with the attempted murders of Robert Anderson, Amir Kiumarsi, Aleksandra Kozhevinikova, Mavis Justino, Morgan McDougall, Jun Seok Park, Samantha Peart, So Ra, Catherine Riddell, Sammantha Samson, Beverly Smith, Amaresh Tesfamariam and Yunsheng Tian. Two men who left the scene after being hit were later identified by police from dashcam footage and charges of their attempted murders are anticipated, as is a sixteenth. The Toronto subway and bus services in the area were immediately closed or rerouted by the Toronto Transit Commission (TTC). Parts of Yonge Street were cordoned off until late on April 24 for the police investigation. Civic buildings in the area were closed late April 23 and remained closed throughout April 24. Area businesses were allowed to remain open, but in areas of pedestrian deaths, those fronting on Yonge Street were allowed access from only the rear entrances. Many businesses in the most-affected areas chose to close down for all of April 24, while some opened at different times of the afternoon of April 24. The area was fully open and transit services resumed by April 25. Security was heightened around a meeting of G7 security ministers being held in Toronto in advance of the 44th G7 summit in La Malbaie, Quebec. The ministers were briefed on the attack shortly after it occurred and the day after the attack, the meeting's agenda included discussion on "soft targets", terrorism and social media, and online youth radicalization. Around the Air Canada Centre, roads were closed and blocked off with dump trucks, due to safety concerns for fans gathered at Maple Leaf Square to watch the National Hockey League playoff game between the Toronto Maple Leafs and Boston Bruins on the evening of April 23. A moment of silence was observed during the game in sympathy for the victims. Concrete barriers were put up along the edge of the sidewalk along Bremner Boulevard in front of the Rogers Centre, due to the same safety concerns prior to the Toronto Blue Jays game against the Boston Red Sox on April 24, 2018. Prior to the game, the Blue Jays honoured a few of the first responders in a ceremony, which included a video memorial for the victims of the attack followed by a moment of silence. Many domestic leaders expressed their support and condolences in the immediate aftermath of the attack, including Canadian Prime Minister Justin Trudeau, Opposition Leader Andrew Scheer, and Ontario Premier Kathleen Wynne. Toronto Mayor John Tory added that the city would support the police investigation. Constable Ken Lam was lauded as a hero for his measured use of force to achieve a non-fatal resolution of his confrontation with Minassian, despite Minassian's seeking suicide by cop. Lam insisted that he was simply performing his duty. Lighting at the CN Tower and the 3D Toronto sign at Nathan Phillips Square were colourless and dimmed for the evening of April 23. Flags were placed at half-mast at most government locations in Toronto and surrounding municipalities. An impromptu memorial at Olive Square Park on the east side of Yonge Street, directly across the street from where the attack began, was started by a local resident at 5:15 p.m. of the same day for people to place flowers and express their grief in writing. The person who started the memorial indicated that all the other public spaces along Yonge Street, including Mel Lastman Square, were cordoned off by police tape so he chose Olive Square which was not cordoned off. Small memorials ranging from a few bunches of flowers to about two dozen bunches of flowers, plus paper messages, photographs and candles in some cases, were established at each location from just south of Finch Avenue to just south of Park Home Avenue where a pedestrian was killed (at the southwest corner of Yonge Street and Park Home Avenue two victims were killed). Next to the fountain at the entry to Mel Lastman Square, where the greatest number of people were struck (at least two killed), another memorial gradually grew to become a hub memorial almost as large as the one at Olive Square. Several crowdfunding campaigns were set up to raise money for the expenses of the victims' families. Prominent Canadian Muslim charities included Islamic Relief Canada and Canada Zakat, that raised funds after the Quebec City mosque shooting, collected large numbers of donations. To better coordinate crowdfunding, the City of Toronto established the #TorontoStrong Fund to support victims and their families, first responders, and those affected by trauma. The hashtag was reused in memoriam of the victims of a fatal mass shooting that occurred in the Danforth on July 22 of the same year. Several vigils were held in the following week. A small vigil was held at Lastman Square on the evening of April 24. Another was held by the Toronto Korean Community Association on April 27 at Lastman Square. The "#TorontoStrong" vigil was held by the City of Toronto on April 29, attended by several thousand. It began with a march from Yonge and Finch and ended with a gathering at Lastman Square. Speaking at the gathering were community leaders and attending were Prime Minister Trudeau, Governor General Julie Payette, Premier Wynne, Quebec Premier Philippe Couillard, and Mayor Tory. The two main impromptu memorials at Olive Square Park and Mel Lastman Square were decommissioned on June 3, 2018, and later replaced with a temporary plaque. Mayor John Tory announced plans to erect a permanent memorial for the attack. On June 13, 2018, the #TorontoStrong's volunteer steering committee announced the appointment of former Toronto mayor Barbara Hall as fund administrator. She was tasked with distributing the money raised for the victims and survivors. By December 2018, over $4 million from the fund had been distributed to victims and families of the van attack and the Danforth shooting. ^ Tait, Melissa. "Toronto van attack: What we know about the lives lost, the suspect and more". The Globe and Mail. Toronto. Retrieved April 26, 2018. ^ Gillis, Wendy; Powell, Betsy (April 25, 2018). "Rampage victims mainly women". Toronto Star. Retrieved April 26, 2018 – via www.pressreader.com. ^ Austen, Ian; Stack, Liam (April 23, 2018). "Toronto Van Plows Along Sidewalk, Killing 9 in 'Pure Carnage'". The New York Times. Retrieved April 23, 2018. ^ "Canada's Trudeau says security unchanged after Toronto van attack". France 24. April 24, 2018. Retrieved April 24, 2018. ^ "A Grim History of Mass Killings in Canada". Toronto Star. April 24, 2018. Retrieved April 25, 2018 – via PressReader.com. ^ "A history of violence on Canadian soil". Toronto Star. Retrieved November 1, 2018. ^ a b Madhani, Aamer; Bacon, John (April 24, 2018). "Toronto van attack suspect Alek Minassian's Facebook account praised mass killer". USA Today. Retrieved April 25, 2018. ^ "9 dead, 16 injured after van strikes pedestrians in North York". CBC News. April 23, 2018. Retrieved April 23, 2018. ^ a b Passifiume, Bryan; Connor, Kevin; Stevenson, Jane (April 23, 2018). "10 dead, 15 wounded when van hits pedestrians near Yonge and Finch". Toronto Sun. Retrieved April 23, 2018. ^ a b Kassam, Ashifa; Cecco, Leyland (April 23, 2018). "Toronto incident: suspect in custody after van ploughs into crowd, killing nine". The Guardian. Retrieved April 23, 2018. ^ a b McLean, Jesse; Welsh, Moira; Palamarchuk, Andrew (April 23, 2018). "10 dead, 15 hurt as van mows down pedestrians along Yonge St.; suspect named". Toronto Star. Retrieved April 23, 2018. ^ a b Ha, Tu Thanh; Gray, Jeff; Hayes, Molly (April 23, 2018). "Massive investigation into Toronto van attack will shut down parts of Yonge Street for days". The Globe and Mail. Toronto. Retrieved April 24, 2018. ^ Crilly, Rob; Guly, Christopher; Molloy, Mark (April 24, 2018). "What do we know about Alek Minassian, arrested after Toronto van attack?". The Telegraph. ISSN 0307-1235. Retrieved April 24, 2018. ^ Hui, Ann; Friesen, Joe; Moore, Oliver; Norman, Heather (April 23, 2018). "Twenty-five minutes of horror on Yonge Street: How the Toronto van attack unfolded". The Globe and Mail. Retrieved April 27, 2018. ^ "Sunnybrook receives injured from Yonge and Finch". sunnybrook.ca. Sunnybrook Health Sciences Centre. April 23, 2018. ^ Gillis, Wendy; Moon, Jenna (April 25, 2018). "Arresting officer Ken Lam wonders: 'Did I make the right decision?'". Toronto Star. ^ a b c Rocha, Veronica; Ries, Brian (April 23, 2018). "Van strikes pedestrians in Toronto". cnn.com. CNN. Retrieved April 23, 2018. ^ Hayes, Molly; Friesen, Joe; Moore, Oliver (April 23, 2018). "Ten people dead, 15 injured after van hits pedestrians in north Toronto". The Globe and Mail. Toronto. Retrieved April 23, 2018. ^ Sabur, Rozina; Riley-Smith, Ben; Guly, Christopher; Crilly, Rob (April 23, 2018). "Suspect named after van ploughs into pedestrians in Toronto leaving ten dead and 15 injured". The Telegraph. ISSN 0307-1235. Retrieved April 24, 2018. ^ a b c d "What we know about Alek Minassian, alleged driver in deadly Toronto van attack". CBC News. April 23, 2018. Retrieved April 24, 2018. ^ Dempsey, Ann (May 11, 2018). "'I was like, how did he get a van?' Inside the life of Alek Minassian, the Toronto van rampage suspect no one thought capable of murder". Toronto Star. ^ a b c Powell, Betsy; Pagliaro, Jennifer; Gillis, Wendy (April 24, 2018). "Most victims in van rampage on Yonge St. were women, police say". Toronto Star. Retrieved April 24, 2018. Minassian was ordered not to have contact with any of the 13 attempt murder victims and when asked if he understood, he sharply said, "Yes." ^ Goodfield, Kayla; Wilson, Codi (April 23, 2018). "Van attack that killed 10 people in North York was 'definitely deliberate': police". CP24. ^ Bell, Stewart (April 25, 2018). "'He wasn't a terrorist': Those who knew Alek Minassian struggle to explain the Toronto van attack". Global News. ^ a b Humphreys, Adrian; Edmiston, Jake (April 24, 2018). "Toronto van attack suspect Alek Minassian's interest in 'incel' movement the latest sign of troubled life". National Post. Archived from the original on April 27, 2018. Retrieved April 24, 2018. ^ Agencies (April 24, 2018). "Deadly Toronto van driver: What we know about Alek Minassian". GulfNews. Retrieved April 24, 2018. ^ Monsebraaten, Laurie (April 26, 2018). "'We're not a violent group of people': Ex-classmate of Alek Minassian speaks out about autism". Toronto Star. Retrieved September 16, 2018. ^ Grimaldi, Jeremy (April 24, 2018). "Alleged attacker Alek Minassian may have mental health issues". Richmond Hill Liberal. Metroland Media Group. Retrieved December 16, 2018. ^ Frisk, Adam (April 24, 2018). "Toronto van attack: What we know about suspect Alek Minassian". Global News. Retrieved April 25, 2018. ^ "Facebook post linked to Toronto van attack points to insular, misogynistic world of 'incels'". CBC. April 25, 2018. Retrieved April 26, 2018. ^ "Why some 'incels' are celebrating accused in Toronto van attack". CBC. Retrieved April 25, 2018. ^ Koulouris, Theodore. "Online misogyny and the alternative right: debating the undebatable." Feminist Media Studies (2018): 1-12. ^ Makuch, Ben. "Exclusive: Toronto van attack suspect Alek Minassian was a member of the Canadian Army". VICE News. Retrieved April 25, 2018. ^ Boyd, Brian (April 27, 2018). "Pathological Incel misogyny and myth of male oppression". The Irish Times. ^ Wendling, Mike (April 24, 2018). "What is an 'incel'?". BBC News. Retrieved April 26, 2018. ^ Beauchamp, Zack (April 25, 2018). "Incel, the misogynist ideology that inspired the deadly Toronto attack, explained". Vox. Retrieved April 25, 2018. ^ Fox, Chris (April 24, 2018). "Facebook post connected to van attack suspect's profile references 'Incel Rebellion'". CP24. Retrieved April 24, 2018. ^ a b O'Kane, Josh (April 24, 2018). "Facebook post connected to suspect in van rampage cites 'incel rebellion'". The Globe and Mail. Retrieved April 24, 2018. ^ "Elliot Rodger: How misogynist killer became 'incel hero'". BBC News. April 26, 2018. Retrieved April 26, 2018. ^ Yang, Jennifer; Campion-Smith, Bruce (April 25, 2018). "Number cited in cryptic Facebook post matches Alek Minassian's military ID: Source". Toronto Star. Retrieved April 26, 2018. ^ Wilson, Codi (April 24, 2018). "Suspect in Toronto van attack charged with 10 counts of first-degree murder, 13 counts of attempted murder". CTV News. Retrieved April 24, 2018. ^ Dube Dwilson, Stephanie (April 24, 2018). "Alek Minassian's Parents & Family: 5 Fast Facts You Need to Know". Heavy.com. Retrieved April 28, 2018. Alek’s father, Vahe Minassian, was also there, sitting in the front row as the charges were read against his son. Vahe was stunned and cried inside the courtroom. [...] He told reporters that he had not spoken to his son, and he appeared heartbroken. ^ "Accused in van attack charged with 3 more counts of attempted murder". CBC News. May 10, 2018. ^ May 10, CBC News · Posted:; May 10, 2018 4:00 AM ET | Last Updated:. "Accused in deadly Toronto van attack charged with 3 more counts of attempted murder | CBC News". CBC. Retrieved December 7, 2018. ^ Canadian Press (January 31, 2019). "Case of Toronto van attack accused Alek Minassian put over". Toronto Sun. ^ a b c "All 10 of those killed in Toronto van attack identified". CBC News. CBC News. April 27, 2018. Retrieved April 27, 2018. ^ Rizza, Alanna; Gillis, Wendy (April 27, 2018). "Coroner officially identifies victims of Yonge St. van rampage". Toronto Star. ^ McQuigge, Michelle (April 27, 2018). "Eight women and two men killed in Toronto van attack: coroner". National Post. ^ a b Sanchez, Ray; Vera, Amir (April 25, 2018). "These are the victims of the Toronto van attacks". CNN. Retrieved April 25, 2018. ^ Gibson, Victoria (April 30, 2018). "Andrea Bradden is remembered in communities across the GTA". Toronto Star. Retrieved May 3, 2018. ^ Gibson, Victoria (April 30, 2018). "Geraldine Brady remembered as a 'lifelong friend' with a 'positive attitude and smile'". Toronto Star. Retrieved May 3, 2018. ^ Abedi, Maham (April 26, 2018). "Toronto van attack victim identified as So He Chung, 22". Global News. Retrieved April 28, 2018. ^ Dangerfield, Katie (April 24, 2018). "First of 10 victims killed in Toronto van attack identified as Anne Marie D'Amico". Global News. Retrieved April 24, 2018. ^ Agular, Bryann; Kerr, Jaren (May 2, 2018). "Anne Marie D'Amico 'lived her life to the fullest,' brother says in eulogy". Toronto Star. Retrieved May 5, 2018. ^ Joseph, Rebecca (April 25, 2018). "Betty Forsyth, 94-year-old woman who loved to feed the birds, named as victim in Toronto van attack". Global News. Retrieved April 28, 2018. ^ a b Wilson, Codi; Goodfield, Kayla (April 25, 2018). "Three of ten victims killed in North York van attack identified". CP24. Retrieved April 28, 2018. ^ Gibson, Victoria; Gordon, Andrea (April 24, 2018). "Jordanian man confirmed dead in Toronto van rampage". Toronto Star. Toronto, Ontario, Canada. Retrieved April 24, 2018. ^ Mandel, Michele (April 24, 2018). "Toronto van attack suspect charged with 10 counts of first-degree murder". Ottawa Sun. Retrieved April 26, 2018. ^ DeClerq, Katherine (April 23, 2018). "Investigation into deadly van incident closes roads in North York". CP24. Retrieved April 23, 2018. ^ @TorontoPolice (April 23, 2018). "It is anticipated that investigators will be on scene for several days, leading to road closures. Alternate routes instead of Yonge Street are Beecroft Road and Doris Avenue" (Tweet). Retrieved April 23, 2018 – via Twitter. ^ Breen, Kerri (April 24, 2018). "Toronto van attack: road closures remain in effect Tuesday morning". Global News. ^ Brewster, Murray (April 22, 2018). "G7 ministers sit down in Toronto to a full plate of world troubles". CBC News. Retrieved April 24, 2018. ^ Brewster, Murray (April 24, 2018). "G7 security ministers gathered in Toronto discuss 'soft targets' and online radicalization after van attack". CBC News. Retrieved April 24, 2018. ^ News Staff (April 23, 2018). "Security Heighten Outside Air Canada Centre Prior Maple Leafs Game". 680news.com. 680 News. Retrieved April 23, 2018. ^ 52 Division, Toronto Police Service (April 23, 2018). "Air Canada Centre and Maple Leaf Square, Traffic restrictions and security enhancements". torontopolice.on.ca (Press release). Toronto Police Service. ^ Nielsen, Kevin (April 23, 2018). "Maple Leafs hold moment of silence for victims of Toronto van attack". Global News. Retrieved April 24, 2018. ^ Wilson, Codi (March 29, 2018). "New security measures in place for Blue Jays' home opener". cp24.com. CP24. Retrieved May 4, 2018. ^ "Blue Jays honour victims of deadly van attack with brief tribute". toronto.ctvnews.ca. CTV News Toronto. April 24, 2018. Retrieved May 4, 2018. ^ a b CTV News staff (April 23, 2018). "Trudeau, Wynne react to Toronto van attack". CTV News. Retrieved April 23, 2018. ^ Kassam, Ashifa (April 26, 2018). "Toronto police officer hailed as hero for arresting suspect without firing shot". The Guardian. Retrieved April 26, 2018. ^ Burman, Dilshad; Pereia, Diana (April 25, 2018). "Arresting officer in Toronto van attack doesn't want to be called a hero". City News. Retrieved April 26, 2018. ^ Madhani, Aamer (April 26, 2018). "Toronto cop who arrested van attack suspect without firing a shot insists he's no hero". USA Today. Retrieved April 26, 2018. ^ Abadi, Mahem (April 23, 2018). "Toronto sign dimmed, flags lowered to honour victims of deadly van attack". Global News. ^ "Local resident starts memorial outside scene of van attack". CityNews. April 23, 2018. Retrieved April 24, 2018. ^ Kennedy, Brendan (April 27, 2018). "The day Yonge St. became a war zone: How the van rampage unfolded moment by moment". Toronto Star. ^ a b Brown, Ian (April 29, 2018). "'This is what large cities do with tragedy': Walking the route of the attack to understand Toronto's pain and healing". The Globe and Mail. Retrieved May 2, 2018. ^ a b DH Toronto staff. "GoFundMe campaigns launch to raise funds for victims of Toronto van attack". dailyhive.com. ^ Saminather, Nichola (April 26, 2018). "Canadian Muslim charities lead fundraising for Toronto van attack victims". www.reuters.com. Reuters. ^ Jones, Alexandra (April 26, 2018). "#TorontoStrong Fund raises more than $893,000 in first 48 hours". Toronto Star. ^ a b Wilson, Codi (April 25, 2018). "City of Toronto to hold vigil for victims of van attack". cp24.com. CP24. ^ Wilson, Codi (April 25, 2018). "Latest van attack victim identified as single mom originally from Sri Lanka". cp24.com. CP24. ^ Pagliaro, Jennifer; Mendleson, Rachel (April 29, 2018). "'It hasn't broken us' — #TorontoStrong vigil filled with messages of grief and resilience". Toronto Star. ^ "Trudeau, Couillard join thousands in remembering victims at Toronto Vigil". CTV News Montreal. The Canadian Press. April 29, 2018. 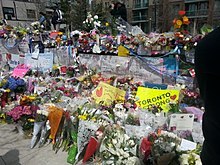 ^ "Toronto plans permanent memorial for victims of deadly van attack". The Globe and Mail. June 3, 2018. Retrieved June 7, 2018. ^ Martinelli, Andrea (June 13, 2018). "#TorontoStrong Fund names former Mayor Barbara Hall as administrator" (Press release). City of Toronto. ^ "#TorontoStrong Fund distributed to victims and families of Yonge Street van attack and the Danforth shooting". toronto.ca (Press release). City of Toronto. December 7, 2018. ^ "Air India 182: How much does Canada care about the worst mass murder in its history?". CBC News. Retrieved April 25, 2018. ^ "Polytechnique massacre remembered in Montreal". CBC News. December 6, 2017. Retrieved April 25, 2018. Wikimedia Commons has media related to 2018 Toronto van incident.